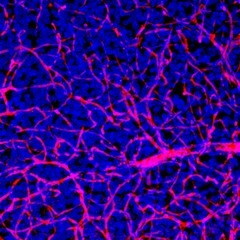 This image shows a dense network of blood vessels (red) and nuclei (blue) obtained from mouse brain tissue that was optically cleared to look deeper into the tissue than otherwise possible. The brain’s blood vessels are nearly impermeable, allowing only the passage of key nutrients while blocking that of harmful substances. Unfortunately, this blood-brain barrier (BBB) also excludes most therapeutics. By designing drug-containing nanoparticles that can “hitchhike” across the BBB, researchers hope to finally penetrate the barrier, and deliver life-saving drugs to cancers in the brain. Pictured here is brain tissue before exposure to the experimental nanoparticles.